Sleek and chic, stackable and oh so comfortable! A pedigree piece from Teak Warehouse, the Romansa Wicker Dining Side Chair in Kubu is an excellent versatile chair for the modern home, or adding to a classic table. A very simple but confident design, the Romansa Wicker Dining Side Chair (Kubu) features a basic chair shape, highlighting the use of Viro® wicker in the long legs, flat back and base. 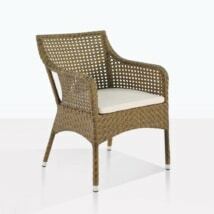 Easy to stack, this chair is fast becoming one of our best-sellers at Teak Warehouse! 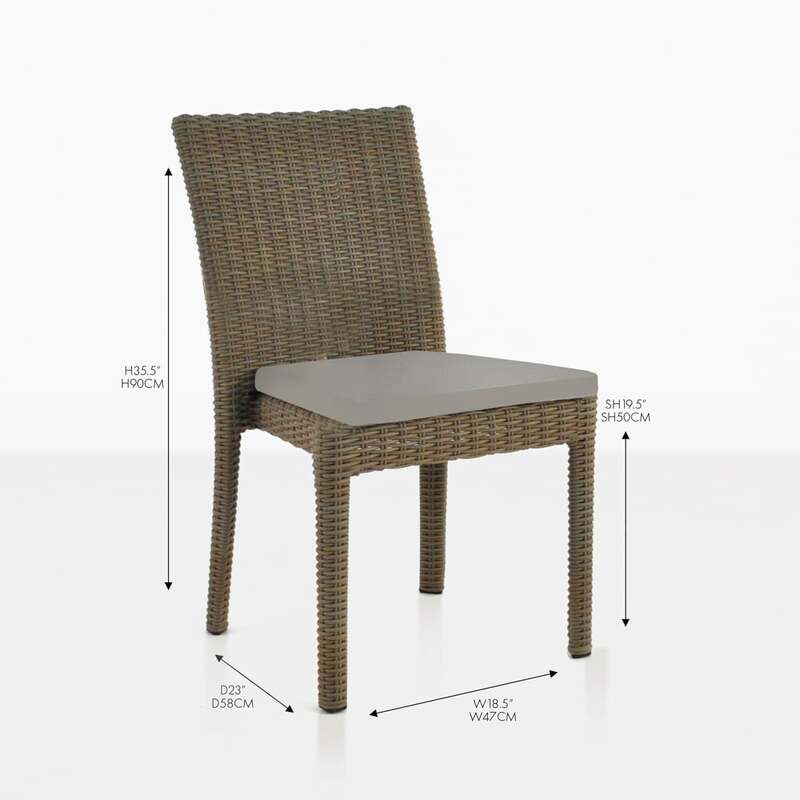 W18.5" x D23" x H35.5"
The Romansa Wicker Dining Side Chair (Kubu) is constructed using the best quality materials to ensure a long life in the outdoors! Starting with a powder-coated aluminium frame, this lovely chair is strong, hard-wearing and easy to clean. Powder coating stops corrosion and looks lovely where the aluminium pokes through. Woven around your hardy frame is fantastic Viro® wicker, a product that is well regarded worldwide for its durability and impressive design options. Each piece of wicker is through-dyed to combat those harsh UV rays, will not crack, discolor or morph in extreme temperatures and looks incredible year round! Viro® is just one of our tremendous all weather wickers, choose from this beautiful brand or new Ecolene® or classic Rehau® for a variety of color, style and feel! Teak Warehouse is proud to bring you these marine grade products at wholesale prices. We can provide you with amazing, luxury products for every outdoor area! Whether you’re in need of a dining table and chairs, a relaxing area, a bar set up, or something for poolside; we have it all! Our range spans from all weather wickers to A-Grade Teak, Raw Concrete, Reclaimed Teak, Textilene® mesh, Batyline® mesh, Resin. Aluminium and #316 Stainless Steel. Get ready for all of the choices! We have over 700 products, making sure that every taste and style of architecture is accounted for! Need to create a classic dining set for a traditional home but need something just a little different? Want comfort, clean lines and a chic touch? Line a long teak table with several Romansa Wicker Dining Side Chairs (Kubu) for an elegant edge to a classic setting. Fill a few low rectangular planters in Raw Concrete with scented herbs, perfect for freshly picking and adding to your meals as you host fabulous luncheons and glamorous dinners! We’re imagining an apartment setting, there isn’t much space on the balcony but you want to make the most of it when the sun streams in. How about a small concrete table, perhaps one of our Blok round variety, in the center of your area, place four of these neat, chic Romansa Wicker Dining Side Chairs in a matching gray Kubu and voila! Modern living is made refined and easy! The Romansa Wicker Dining Side Chair (Kubu) has a matching Arm Chair and also comes in gorgeous chocolatey Java Brown – choose what option works best for you and enjoy the luxury of this simply stunning chair! 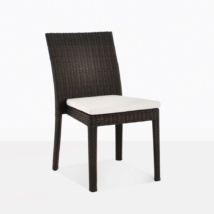 Our Romansa Wicker Dining Side Chair (Kubu) is in store now, call us today to order yours!